Robert Barro talked about his views of the effect of the 2017 “Tax Cuts and Jobs Act”. He argued that the lower corporate tax rates will lower the cost of capital, and raise the long-run GDP by around 8%. He also argued that the individual tax cuts will raise the incentive for individuals to work and could raise long-run GDP by another 1-2%. Robert J. Barro is Paul M. Warburg Professor of Economics at Harvard University. 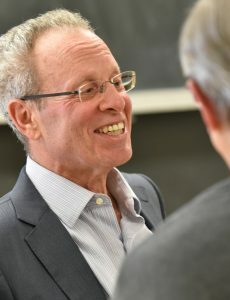 His research includes empirical determinants of economic growth, the economic effects of public debt and budget deficits, and the formation of monetary policy. Recent books include Macroeconomics: A Modern Approach, Economic Growth, Nothing Is Sacred: Economic Ideas for the New Millennium, Determinants of Economic Growth, and Getting It Right: Markets and Choices in a Free Society. He was a viewpoint columnist for Business Week from 1998 to 2006 and a contributing editor of The Wall Street Journal from 1991 to 1998. He has written extensively on macroeconomics and economic growth.